When I was five years old I staged my first protest against food. I wanted no part of the pale, boiled, steaming heap of vegetables that my Mother told me was"really good for me!" Like her mother before her; my mother was doing what all good Irish moms do...serving up boiled parsnip to accompany the Sunday roast. I didn't know then what I know now, parsnips are not only delicious and very nutritious; they have a rich history of cultivation and were an important mainstay on dinner tables throughout Europe as early as the 16th century. The parsnip is native to the eastern Mediterranean region and it is from this old world heritage that our modern day parsnips hail. Parsnip (Pastinaca sativa) is from the Apiaceae family which includes other popular veggies like carrots, parsley and celery. Its use as a food goes back to the time of the ancient Romans. Wild Parsnips were imported from Germany where they grew in profusion and were imported annually for the emperor's table. Like carrots, parsnips have been cultivated from the wild and used for food and medicine since the 1500s. They were a staple in 16th century European household; pre-dating the potato by over a century. Early English colonists brought parsnips to America and they have been cultivated here ever since. In many parts of Canada and the United States; wild parsnip is considered an invasive weed because it is not native to North America. Earlier agricultural efforts led to the spread of seed causing parsnip to escape cultivation into the wild. 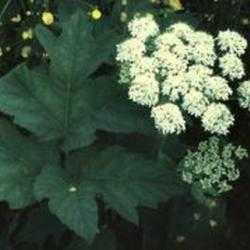 The United States Department of Agriculture lists Wild Parsnip as a "noxious weed." Wild parsnip is edible, too; but does not exhibit the more refined flavours of its cultivated counterpart. Remember, never eat any plant found in the wild unless you are absolutely certain of correct identification. Poison hemlock (Conium maculatum) is a member of the same family as parsnip and is similar in appearance. It is very toxic to humans and livestock and grows throughout the United States and southern areas of Canada. Parsnip has a biennial life cycle. The first year plant is generally a low growing basal rosette of leaves that look like celery leaves rising above a sturdy, long taproot. In the subsequent growing season, the above ground foliage rises into a multi branched plant that can reach 5 feet in height. It is from the second season plant that yellow flowers form in an umbel, eventually producing an abundance of seeds. In agricultural production-parsnip is grown as an annual. So you think you might like to try your hand at growing parsnips? The first thing you will need is time. Parsnips are known as a long season crop: the seeds are sown early in the spring and harvest is well into the frost filled days of autumn and early winter. Typically, parsnips require between 110 to 130 days before reaching maturity although some cultivars including 'Harris Model' can mature in 85-90 days. Because it is a true biennial-parsnip can stay in the ground all winter and sometimes harvesting takes place as late as March and early April, before the ground thaws and the plant begins growing again.The sweetness of parsnips is enhanced by continued exposure to cold temperatures due to the conversion of starches to sugars, and should be left in the ground as long as practical and then transferred to cold storage. Parsnips, like carrots-,grow best in soils that are deeply tilled and free of rocks and stones. Obstructions or soil compaction can cause the taproot to grow mishapen or 'forked'. Parsnips prefer soils that are slightly acid to neutral. The seeds are generally sown in early spring, about 1/2 inches deep and 2 to 3 seeds per inch. Space the rows about 24 inches and when seedlings emerge you can thin out the plants to about 6 to 8 inches. In commercial production-seeds are sown by machine and plant spacing is predetermined. Gardeners interested in heirloom varieties can purchase seeds from open-pollinated, non-hybrid stock available through several seed companies. Parsnip seeds do not have a long shelf life and viability diminishes after about one year. For best results always use fresh seeds. The optimum growing conditions include full sun, and moist soils with good drainage. A note of caution: if you intend on growing parsnips be careful when handling the leafy above ground parts. The sap within the leaves and stems of parsnip contain a chemical compound which when combined with sunlight causes dermal burning similar to sunburn. This is sometimes referred to as "false or artificial sunburn." Wear suitable protective gloves when handling parsnip plants. Looking like an overgrown, washed out carrot; parsnips are pale yellow-ivory in colour. 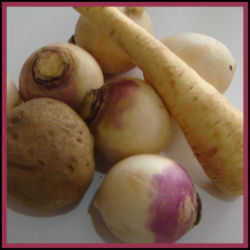 They are generally round shouldered and taper to a thin point-although there are some cultivars that are rounded like turnips. Parsnips are usually sold in the grocery store without their leafy tops although parsnip greens can be blanced and used in salads. There are many cultivars of parsnips available-the most popular include: 'All American', 'Hollow Crown Improved', and 'Harris Model' all similar in size, shape and colour. For a parsnip with some history-try cooking with 'The Student' --one of the earliest cultivars developed in England in the mid-19th century and still popular today. Despite being overshadowed in the culinary world by its more colourful cousin the carrot- the parsnip is versatile and practical. It stores well in a cold cellar (optimum storage temperatues are just above freezing) and is an excellent fresh vegetable that is available from autumn through winter when many other fresh vegetables are in short supply. Parsnip is a popular choice for many hearty festive meals including Thanksgiving, Christmas and Easter. During its early history; parsnips were often served during Lent. Readily available and chock full of nutrients; parsnips with their spicy, sweet flavour were a nutritious choice for Christians observing a meatless fast. All parts of the plant are considered edible but it is the strong, straight tap root that is prized and most cultivation efforts are aimed at enhancing this part of the plant and optimizing its growth period. From Parsnip-Rhubarb soup to Parsnip Pancakes there is a place at every meal for parsnips. From its early days boiled and served with salt-fish to early American recipes such as Parsnip Muffins to modern creations like Parsnip Pancetta Flan; the parsnip deserves a lead place at our table. The parsnip can be roasted, boiled, fried, baked, stewed, chopped, grated, sliced and diced. 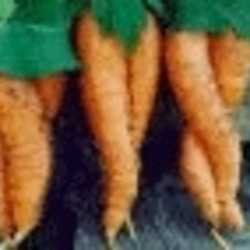 In fact...move over carrots-your cousin parsnip is readily interchangeable in many traditional carrot recipes. How about Parsnip Cake with Vanilla Cream Cheese Icing? I should let my Mom in on a little secret. Another part of our Irish heritage includes making delicious beers using the boiled roots of parsnips and hops! Well I have a crisper full of parsnips..all I need now are the hops. Cheers! Ontario Ministry of Agricultue, Food and rural Affairs. Commercial Parsnip Productionn in Ontario Fact Sheet. After many years working in a business envrionment-I decided to make a change. I went back to school and have completed a college program in Environmental Land Management and a University program in Horticulture. I continue to study and take courses-I am currently completing a certificate program in Sustainable Landscaping at the University of Guelph. I work as a professional gardener and have my own gardening business. I love the outdoors-12 months of the year! I enjoy dogs and cats and usually have several around for company. I live in Toronto, Ontario.